Bottom fastened! Well, almost. RJ and I still must team as we tighten the tiny hex nuts on every machine thread screw that secures the strakes to one another between the ribs. But at least refastening the plywood skin and below-waterline strakes is behind us! 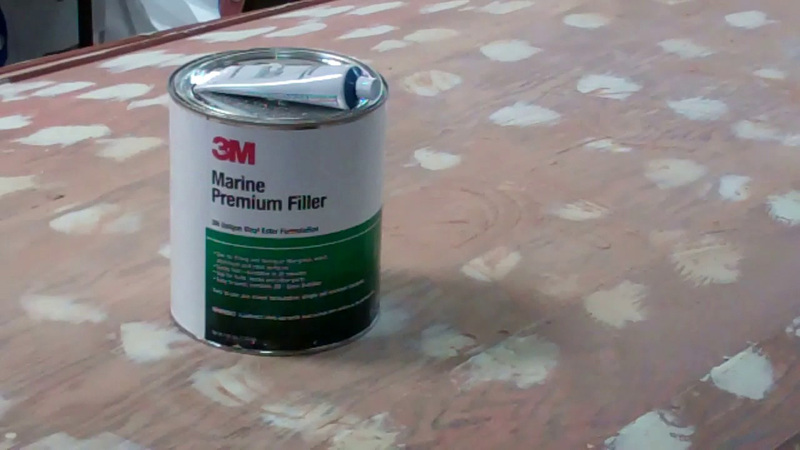 RJ and I have also filled the fasteners countersinks with three applications of 3M Premium Marine Filler, and begun sanding them fair. We have also stripped and bleached the transom, and will be staining it with brown mahogany (042) Interlux Interstain Wood Filler Stain, and then sealing it with CPES. Stripping the topsides and stem will follow, after which I already know from inspecting them that we will face another round of refastening strakes and filling and fairing the countersinks with 3M Premium Marine Filler. Previous PostPrevious 1957 23′ Old Style Lyman Runabout Foredeck Off!